The host of a long-running Rhode Island PBS program is staying with the show after a photo of him in blackface surfaced online late last year. In the 1986 photo, Jim Hummel, who moderates Rhode Island PBS’ weekly political-affairs roundtable A Lively Experiment, is wearing dark face paint and holding a prop gun. At the time, he was 26 and a general-assignment reporter at the Providence Journal. Hummel confirmed the details of the photo to Current and confirmed that he is the man in blackface. The local news site GoLocalProv first reported on the photo Dec. 11. It said the photo had been posted to Facebook tagged with Hummel’s name. Hummel said he was attending a Halloween party dressed as Tubbs from the TV show Miami Vice, who was played by African-American actor Philip Michael Thomas. His Journal colleague Jeffrey Hiday was dressed as Tubbs’ partner, Crockett. In the photo, Hiday wears a white linen suit Don Johnson–style and also holds a prop gun. Rhode Island PBS President David Piccerelli said the station stands behind Hummel. Hummel said he didn’t know who had posted the photo to Facebook and found out about its posting only when GoLocalProv reached him for comment the night before the story’s publication. No one has asked him to apologize since the initial story ran in December, he said. Hummel acknowledged that the photo “looks horrible,” particularly in the aftermath of the scandal that has engulfed Virginia Gov. Ralph Northam. A newly uncovered photo on Northam’s page in his 1983 medical school yearbook shows two men, one wearing blackface and the other in a Ku Klux Klan robe and hood. The governor faces calls from leading politicians on both sides of the aisle to resign. 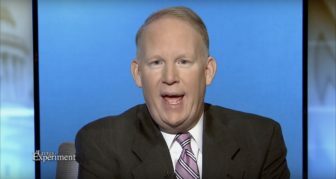 Rhode Island PBS hired Hummel as moderator of A Lively Experiment in 2016, the fourth host in the show’s 31-year history. He had been a guest panelist on the show since 2008. Hummel worked for 13 years at the Journal and another 13 years as an on-air correspondent for the Providence ABC affiliate before leaving in 2009 to start The Hummel Report, a nonprofit news site that has a content partnership with several local publishers. Hummel also hosts and produces Rhode Island PBS’ Rhode Island Spotlight, which profiles local nonprofits in monthly 10-minute inserts. Piccerelli suggested that the GoLocalProv story may have been published as a “retaliatory” act after Hummel and the Lively Experiment staff dropped Kate Nagle, the website’s editor, from regular appearances on the show last year. The decision stemmed from an earlier controversy involving local coverage of a no-bid contract between GoLocalProv and the city of Providence, according to Hummel. The contract was criticized locally because Josh Fenton, CEO and co-founder of GoLocalProv parent company GoLocal24, is a former Providence city councilman. In response, Fenton said in an email that GoLocal24 “NEVER received any feedback from Rhode Island PBS other than positive” when Nagle was a panelist on A Lively Experiment. Fenton — who is Nagle’s husband — pointed out that Nagle was dropped from the show after GoLocalProv published a story about the station violating National Labor Relations Board laws. Hummel said he has been “gratified” by supportive messages he has received since the story’s publication, adding that viewers have been quick to tell him when they were bothered by his reports in the past. “I don’t use that to justify or validate anything, but I would’ve expected a little more reaction,” he said.